SALEM, Ore. — The family of a woman who had been memorialized with a roadside cross in Salem, Oregon has removed the display following a complaint from a prominent professing atheist organization. As previously reported, the Wisconsin-based Freedom From Religion Foundation (FFRF) recently sent a letter to the mayor of Salem to advise that it had received a complaint about the cross off Kuebler Boulevard. It said at the time that it did not know the origin of the display. After the city disclosed to reporters that the cross was actually a memorial to a mother who was killed in a car crash at the location at least a decade ago, and had been placed and maintained by her children, FFRF still found the display to be unconstitutional since it rests on public property. Cheryl Kolbe, the Portland-area leader of FFRF, asserted that the intention of the cross placement does not matter. Mayor Chuck Bennett said he didn’t see the memorial as a government establishment of religion, but rather a symbol “of a family’s love for their mother, and their sadness at her loss, and their desire to commemorate her memory.” The soil immediately surrounding the cross is outlined in the shape of a heart. FFRF says that it is satisfied now that the family has removed the cross to avoid complaint. See photos here. “FFRF is pleased to hear that the cross has been removed. While our hearts go out to the grieving family, we thank them for understanding the problem religious imagery creates on public property,” Markert told reporter Joe Douglass. 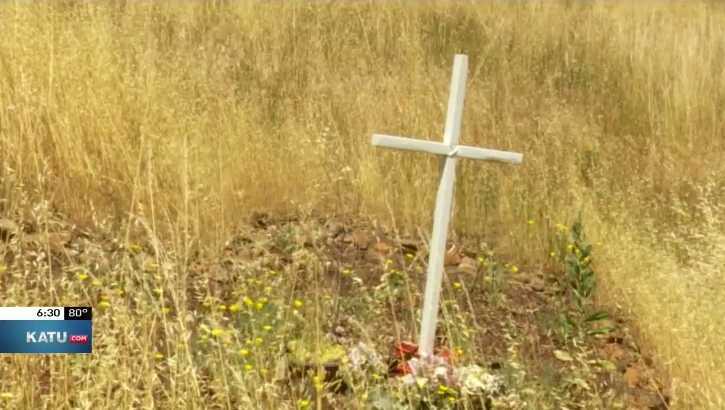 However, many members of the public are now feeling aggrieved over the matter as they state that the cross should have been left in place and the family should be allowed to mourn how they see fit. “I know this family, and it breaks my heart that they are going through this. As if it wasn’t enough for little kids to have to grow up without their mom, now that they are all grown, you’re going to take away what they have left of her and [are] honoring her with,” one commenter stated. “Absurd. I see memorials on the roadside all the time. Some have crosses, some have signs, some have trinkets. It’s a form of healing for people. I’m not into religious symbols, but people who are so easily offended by them need to get over themselves. There are so many more pressing issues going on in the world,” another said. “The cross has been, and I believe will continue to be, a way for people to mark the resting place for loved ones who have passed. It’s a sign of hope and trust that death isn’t just an empty void after life. What’s next, tearing up Arlington?” a third asked.